... but did he know the camera would rally us Apple junkies into naming a niche in photography after it? All the others are "mobile photography"... heck, there's no zip and zing in that. 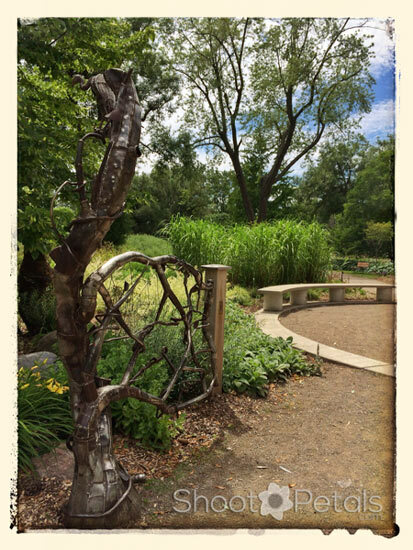 iPhoneography, Toronto Island gate to the Children's Garden. Shot in the native iPhone 5s camera app and edited in Perfect Effects. Amazing colour and detail! ... in 2015 (not that long ago) the World had 5.8B cameras owned by 4B people and 89% of camera owners use a camera phone to take pictures? You'll carry your cell phone but you'll think twice about lugging a heavy camera and gear everywhere you go.... 89% of camera owners obviously agree on that! You can fit all your gear into a fanny pack... and not to be offensive to my Australian friends... a bum bag? Can't count the times I feel like a pack mule struggling and trippin' all over my gear. And I have a sliver of what most other pro photographers have. I once climbed Halla Mountain with 2 camera bodies, three lenses and a tripod... Don't know where Halla Mountain is? Jeju Island, South Korea is where you'll find it. Anyways, the point is... a cell phone picture is a darn sight better than no picture at all. For the average person, a cell phone camera is the ideal solution. And, I'll let you in on a little secret... professional photographers love their cell phone cameras, too! And iPhoneography really has a ton of followers! Who doesn't carry a cell phone and the best camera is always the one you have with you! The relative dimensions of the iPhone image are 3/4 or square (1/1) and the usual dimensions of film and DSLR photos are 2/3. The different sizes don't matter... there are still fundamental things to think about when you design your image. There are some variables, especially with square photos... but you still need to understand the basics. I use the word "design" because I want you to put thought and planning into every image you create. Start thinking like an artist. No more mindless snapshots, we're going to put our intention to work. 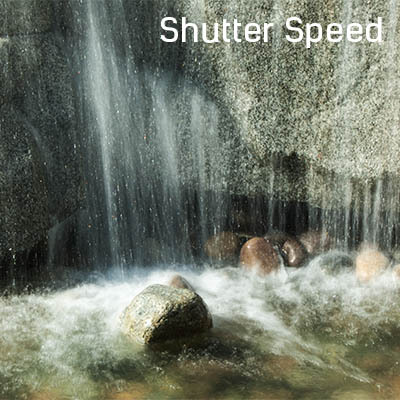 Learn basic photography on this page. Concentrate on photography composition for now, about a third of the way down the page. If you apply what you learn, I guarantee your photos will improve dramatically. iPhone 5s. 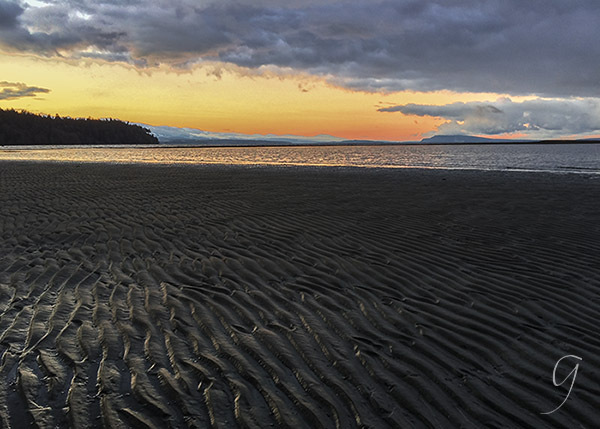 Sunset on the beach, Georgia Strait at Qualicum Beach looking north to Denman and Horby Islands. How good it feels to share and connect with your friends, family and even people you don't know. We all love to see beautiful photos. There are so many sites that have apps you can load up and shoot off your photos for the world to admire. Social media is there for you, so use it. Flickr, Pinterest, FaceBook, Instagram... so many others. Business Insider compared image quality from a $3,000 Canon 5-D Mark 2 DSLR, a Canon Powershot SD1400 and an Apple iPhone 6. The DSLR in every single image. Of course it was... ! For the quality of the images Jane and John Doe need for everyday shooting and sharing photos online, the iPhone does a super-duper job. I mean, really! Just look at the quality of the images here! 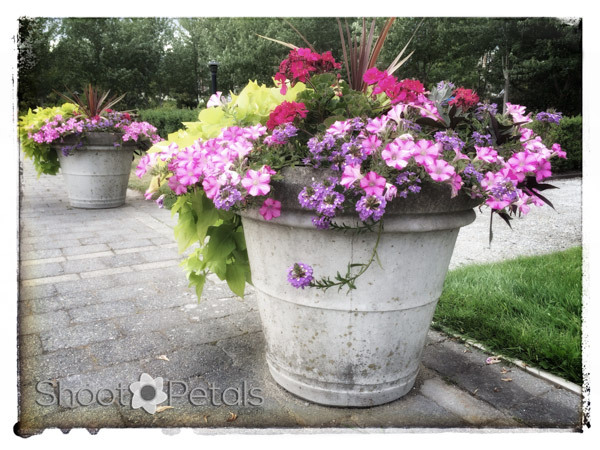 And I'm using my iPhone 5s, not a glitzy new, improved 7.
iPhone 5s photo of various pink flowers in planters. For a cell phone picture, the quality of the image is outstanding. 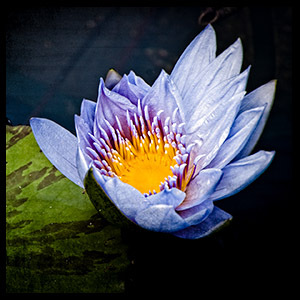 Learn the basic principles of photography to get the best image possible. 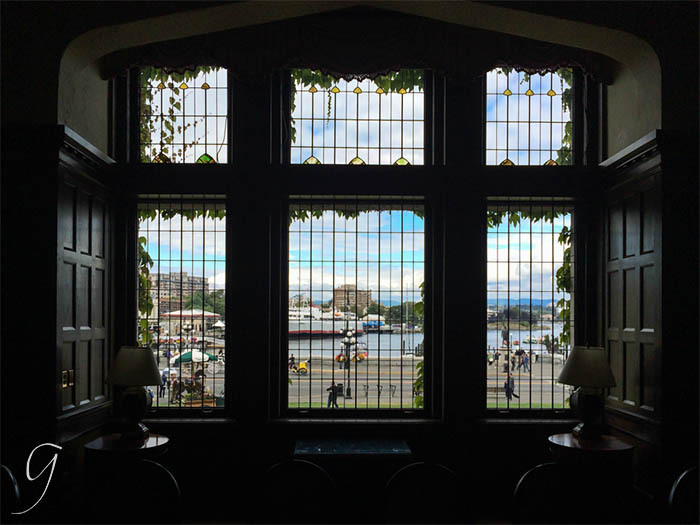 The photo of the Inner Harbour in Victoria from inside the Fairmont Empress Hotel shows a wide range in brightness levels. I didn't want a white sky outside so I used the iPhone camera app to set my exposure for the outdoor scene. I knew exactly what the image would look like.... very dark inside because I'd have to sacrifice the dark area in the beautiful wood finished room. Ya' can't have it all! But I really like this photo with the deep, dark tones in the wall and alcove that frame the outdoor scene. Remember that your camera doesn't capture all the stops of light that your eyes do. If you have a tripod, take 3 bracketed exposures and merge them in your cell phone ... there's an app for that! :)) or in Photoshop. iPhoneography - iPhone 5s. A difficult image because of the wide range in brightness from inside to outside. I exposed for the outside harbour, ships and people. there is no camera that can take great pictures? A camera is just a tool. Only a good photographer can make super photos. No matter how snazzy the camera is, a bad photographer takes crappy images. But a skilled photographer will milk the best out of even a modest camera. The same photography principles apply to iPhoneography and DSLR photography and it's best to learn them. Creative Live dot com has an excellent course on mobile photography (part of the Creative Wow series). If you're interested in all the gadgets, like the Go-Pro, as well as iPhoneography, this is a super course. Here's where you can check it out and look at the entire series while you're there. I'm not an affiliate for CreativeLive... I just adore them so I recommend their courses. I'm sure there's a different iPhone camera app for every day of the year. There's an app for exactly the images you want to create so get your graphic groove on. Might take some time but you'll find the ones you can't live without. I also have Photoshop Mix and Lightroom on my iPhone and iPad. My photos automatically transfer to my iPad... oh, so much easier for these eyes to see! I use Photo Transfer App to exchange photos between my Mac and my devices. Lose your phone and your pictures just once and you'll be bawling in your beer for weeks! If it hasn't happened to you yet... it will. If iPhoneography is your choice of funtography, you'll save a pocket full of cash when you buy your camera accessories. Lenses, like the Olloclip brand I use, expand your iPhone's capabilities for all sorts of experimentation. I've got a telephoto, fish-eye, 2 macros, a wide angle and a polarizer. I went a tad overboard with the fish-eye at first... even dreamed in little round worlds for awhile there. There are multitudes of reasons to buy one or two of these and I can only think of one drawback. You have to take your iPhone out of its case. And that's not too much to ask! Feed your iPhoneography habit and splurge on a lens or two. iPhoneography with an Olloclip fisheye lens. 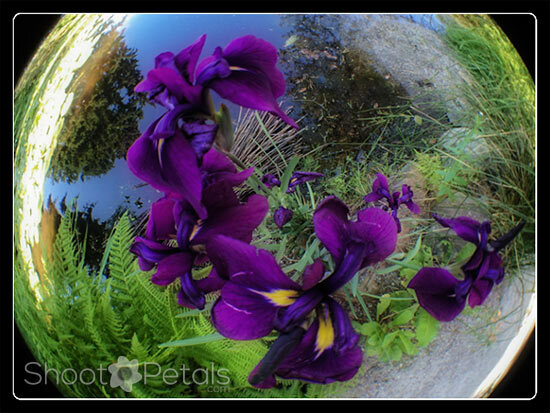 A beautiful little world of deep purple irises enjoying soaking their feet in the stream. Really... it's okay to go small. I took this photo with one of the two Olloclip macro lenses. Best to secure your phone on a tripod or set it securely on something steady. This lens has a very thin field of view and I only got good focus when the lens was so close to the cone, it was almost touching it! If you hand-hold your phone, you won't get a focused image. iPhoneography, a macro lens from Olloclip. The centre cone of a Rudebeckia with the deep orange and yellow flame-like petals. A very narrow depth of field. The detail is incredible and these macros take some getting used to with the persnickety focus. If your flower is moving in a breeze, good luck! Still, I just love using them. And if up close and personal isn't your thing, go to the opposite extreme and try the Olloclip wide angle. Lots of choice for whatever kinds of iPhoneography you like. So, speaking of small... here's another petite piece of equipment for you. No need for a more expensive, regular-sized, tripod, unless you also have a DSLR. 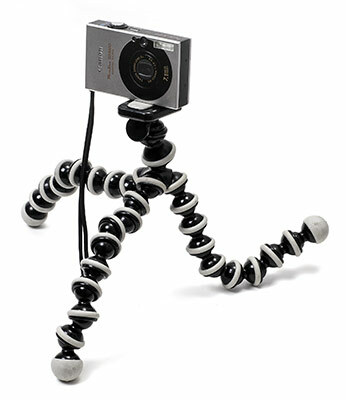 Use a gorillapod to secure your phone and use your headphones to trigger your camera shutter. Those two tricks will get you a macro that's tack sharp. Gorillapods come in several sizes and the heavy duties even hold a hefty DSLR. You can wrap them around fence posts and branches and twist them into all sorts of contortions! One of my absolute favourite things to do in my 'quest for the best' iPhonegraphy app is to shoot panoramas. Want a larger file size so you can print this baby for your wall? With some of the absolutely fabulous panorama apps, you can print some darn fine images, hang 'em on your wall and get full bragging rights. Try some tryptychs. 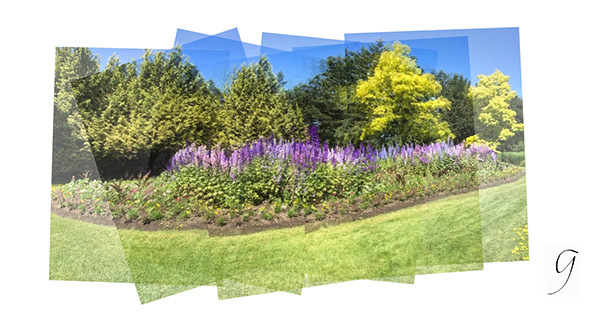 iPhoneography panorama at VanDusen's. You Gotta See This app has several presentation choices. 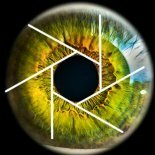 Fun app to play with. Take individual photos with the native iPhone camera app and merge them in Pano 360 and AutoStitch. Or take the images to your desktop photo editor. I use Photoshop CC when my Mac's available. I had my iPhone on a tripod for this panorama. Each image has an overlap of about 1/3 so there's plenty of pixel real estate for Photoshop to work with. Considering the iPhone 5s has a 4 Mb image, shooting iPhoneography panorama can really boost image size. This is almost a 12 Mb file so it would make a good print. iPhone 5s native camera app - 4 individual images of the farm garden at VanDusen Botanical Garden. Images merged in Photoshop CC. I didn't have my Olloclip polarizer with me. Drat, it was way too sunny and bright. I held my Nikon polarizer in front of the lens but it's still a high contrast image. Photographers live by different rules! Who else would ever complain about warm, sunny weather? A circular polarizing lens is a good investment and this little fella' comes with the telephoto lens. A good combination to have. iPhone images are optimized for viewing on an iPhone and, if you're like me, it's sometimes a letdown to my images on a different computer or device. And almost nobody, except pro photographers calibrate their monitors for perfect colour, tone, and brightness. But anyways, the Business Insider man says "if you're taking pictures to text, email, SnapChat, or upload to Facebook, an iPhone will do a [mighty] fine job." Yep, the right equipment for the job at hand. The iPhone camera will do just fine for what most folks need. Welcome to the fun world of iPhoneography. 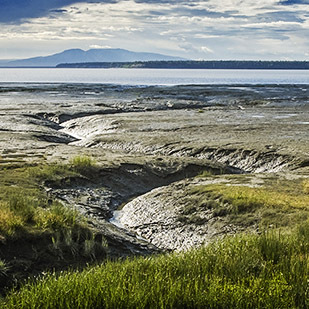 Where: Changes each meetup so we can sample cafes and restaurants in the Parksville / Qualicum Beach area. What happens: An opportunity for locals to get together, meet new friends who enjoy photography... whether you use a cell phone camera, point and shoot, film or DSLR. Anything goes! First 15 minutes is time to order coffee, tea, snacks. Then 45 minutes teaching on photography, a 15 break, and another 45 minutes teaching. There will be different topics at each meetup. Please contact me and make suggestions about what you'd like to learn. Cost: $12 per person per meet up, which does not cover your beverages and snacks. what you can do with your photographs.